You may cover your sins that no one else would know but you cannot hide it from God. God is Omnipresent and Omniscience. He is everywhere, and He knows all things. His word says “our secret sins are in the light of His presence“. I believe sometimes He laughs when He sees us closing doors and windows trying cover the things we do. It is very funny because we cannot hide it from Him. 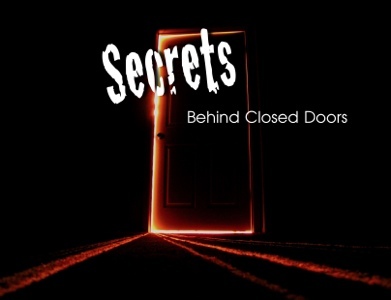 In Acts 5, Ananias and Sapphira thought they were keeping a secret. Hardly did they know they were digging their own graves. You cannot hide your sins from God. What account are you going to give? Friend, when Satan tempts you to close doors, windows, or run away to sin, remember that Nothing in all creation is hidden from His sight. The reason why you are not dead like Ananias and his wife is that God is waiting for you to repent. Every person has got weight, and sin that easily beset him/her so Paul said “since we are surrounded by such a huge crowd of witnesses to the life of faith, let us strip off every weight that slows us down, especially the sin that so easily trips us up. And let us run with endurance the race God has set before us.” (Hebrews 12, NLT). What are you hiding from the public? What sin(s) is/are slowing you down from running your race? I don’t have any idea but I will encourage you to tell it all to Jesus. He has the Power to save you today. I cannot hide it from God. You cannot hide it from God. DOES GOD GIVE AND TAKE AWAY? Is the Lord's Hand waxed short?